with one of our cookbooks! With recipes compiled by the Duval County Historical Commission and histories detailing several communities in Duval County, this book will be a keepsake for anyone familiar with the many tastes of Duval cooking, as well as those seeking to reproduce authentic dishes the way they were prepared for generations in this area. Come by the museum during our operating hours to purchase your copies @ $12 each, or contact us here to let us know about your interest in buying some copies. A biography of the first Pastor of San Diego, Texas--Father Claude Jaillet. The book includes many interesting facts of the life of this priest as well as the life and times of the area back then in the late 1800s-early 1900s. Contact the museum here to purchase your copies. 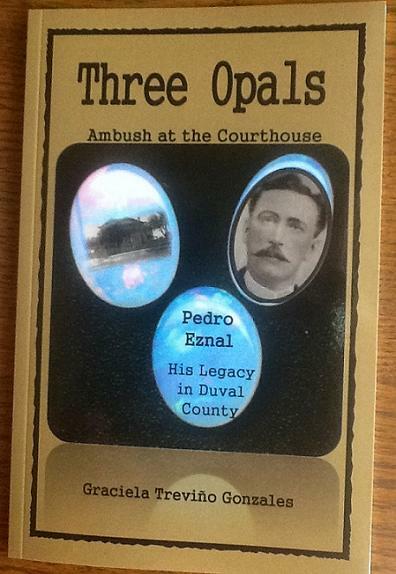 Three opals--three men murdered--and the repercussions of this tragic event a topic of much speculation in the tumultuous early years of the twentieth century in Duval County. Pedro Eznal, a leader of the Mexican Americans in a small South Texas town of San Diego, was one of the men murdered. What became of the murderers? The opals? The destiny of those left behind? If you love a mystery and want to know a little more about Duval County history, then you can buy this book at the museum @ $5.00 per copy, or contact us here to let us know you are interested in buying copies.